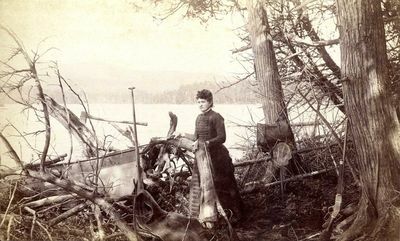 This black and white photograph taken by Maine portrait and landscape photographer E.R. (Edwin Roland) Starbird includes a woman standing on shore near a fish net, guns, and a rowboat. The photograph is one in Starbird's Rangeley Lake Views series created at his studio in Farmington. A list of other photographs in the series is printed on the back. Although not dated, the photo would have been taken during the period of 1882 to 1892 when the studio was based in Farmington. The business then moved to Brunswick where Starbird continued to work until 1911.